Join us on a 17-day bike adventure from the bustling city of Ho Chi Minh City, otherwise known as Saigon, up to Hanoi. This epic tour showcases all aspects of Vietnam; including the poignant aspects of its war-torn history. Indulge in the fragrant and unforgettable Vietnamese cuisine. Cycle through beautiful wetlands, backed by jagged peaks. Travel vast stretches of stunning beaches and sample the freshest seafood available, straight from ocean-to-table. We begin in the South, exploring the vast underground Củ Chi tunnels in Saigon. From there, a short flight to Dalat, or “Le Petit Paris,” hopping on bikes to ride out of the charming city. Through colorful flower plantations, and onto the vistas of Than Tho Lake. Heading towards Da Chay, we’ll tackle challenging hills and the Hon Giao Pass. Muscles may ache, but the views will be worth it. A picturesque rest in the famous blue waters of Nha Trang as we reach the Southeast of Vietnam. The following day, gentle climbs snake along the Da Bia Mountain before a transfer to My Thanh. Here, enjoy the smooth terrain of Tuy Hoa, passing rice fields dotted with water buffalo. Onto the Central Coast at Hoi An, the major trading port, before enjoying the scenic back roads of My Son. Enjoy the spectacular backdrop of mountains as we come into North Vietnam through Ninh Binh, before riding through the pineapple plantations of Haiphong. Finally, we complete this epic adventure on the Northeastern coast; the jewel in the Gulf of Tonkin. The emerald sea of Halong Bay. Transfer a short distance out of town and ride to the famous Cu Chi Tunnels. Rise early to catch a plane for a short flight to Dalat, once a favorite summer retreat among the French. Upon arrival, we'll test our bikes and cycle along lovely country lanes and back roads in the shadow of Mount Langbian. From the hotel we tackle some big hills, including a 2,000-m pass, as we ride through dramatic mountains towards the beach resort town of Nha Trang. For a rest day off the bikes we offer a boat trip to coral islands for swimming and snorkeling. Riding from Nha Trang we stick to the coast, pass fishing villages and have time for a swim. The afternoon ride is flat and on quiet countryside lanes. Riding along a remote road through a mix of tribal and Viet villages, we cover some gentle hills before reaching Quinhon. We follow the coastal road to Tra O lagoon past many fishing villages. After lunch we cruise along the coast to Highway One before transferring to Quang Ngai for the night. We’ll visit the Thien An pagoda on our way to see My Lai, the site of one of the worst massacres of the American/Vietnam War. Our cycle route loops to Ha Lam and we end our day in Hoi An. We ride to visit My Son, the ancient centre of Cham civilization. Although many of the temples were destroyed during the Vietnam War, the existing sites are still sure to impress most visitors. We transfer by bus back to Hoi An. This is the toughest but also the most rewarding day of riding. We start with a climb up Hai Van Pass with breathtaking views of the coast. We then take a coastal side road all the way to Hue, the old capital of the Nguyen Dynasty. After cruising on the Perfume River to Thien Mu Pagoda we get back on bicycle to visit Ming Mang Mausoleum. Then we transfer to the railway station for an overnight train to Ninh Binh. We cycle from our hotel through spectacular karst scenery with limestone mountains soaring in the middle of rice paddies. At Cuc Phuong National Park we visit the primate rescue centre before checking into our accommodation. After exploring more of the park by bike we head east, riding some interesting back roads through many pineapple plantations. We then transfer to Haipong, one of Vietnam’s major ports. After the morning transfer we catch a ferry to Fulong on Cat Ba Island. Once off the boat we roll 27 km on the island’s only road and In the afternoon you are free to explore the area before spending the night on the this heavenly island. We have a short ride in the morning and head for a memorable cruise through majestic Halong Bay. Then we transfer to Hanoi and meet again in the evening for our farewell dinner. Ho Chi Minh city to Hanoi ride. 4th adventure with SpiceRoads. Always an amazing experience. Warm and welcoming Vietnamese. Excellent guides. Great support and always accommodating and flexible. Thank you for running a world class operation. We speak highly of your services in the States. Great way to see Vietnam. Lots of interesting places and facts from knowledgeable friendly guides. A brilliant tour and I thought every day was exciting with a lot of variation. So friendly and happy people and you really feel you experience the country when biking through small villages, along the rice fields and the mountain passes. 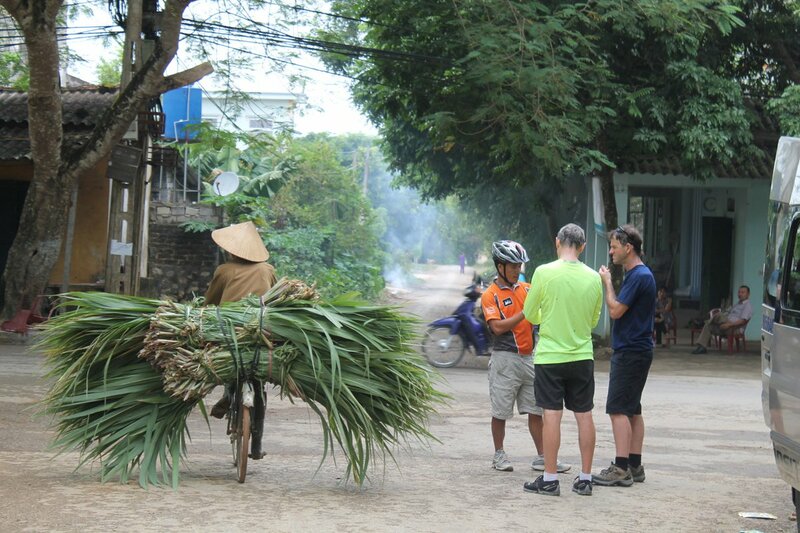 Our biking adventure takes us 1,700 km from Saigon to Hanoi by bus, train, boat, and bike. We cycle about 787 km in 14 cycling days, enjoy a number of rest days, and lots of time can be spent sightseeing and exploring Vietnam. The cycling is on a mixture of well-surfaced roads and good quality dirt tracks. Some of the days are quite long, and experienced riders usually find it sufficiently challenging. Faster cyclists can ride at their own pace after consulting the guides on the route. However, the average rider will want to ride and take photographs, stopping here and there to take in the magnificent sights. If you race through the country, you won't see much. 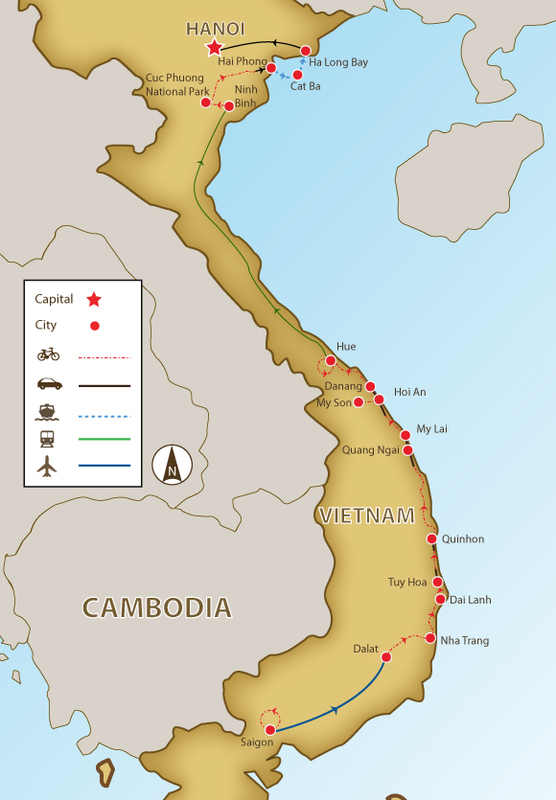 Our route has been designed to explore the Vietnamese countryside that lies on either side of the main north-south artery, Highway 1. We spend no more than 20 km on this busy route. Away from the main roads, cycling in Vietnam is a wonderful experience; the bicycle is the most common form of rural transport, and you will share the road and tracks with beautiful girls in flowing ao dais, school children, and farmers. Such is the friendliness your voice may not be capable of saying 'hello' by the end of the day! Our rest days allow us to explore all the main tourist sites and places of interest along the way. You decide where you wish to go and in your own time. You can take this time on your own in Nha Trang, Hoi An, Hue, and Halong Bay so that you can really get to know and perhaps understand Vietnam and its people. Additionally, of course, our guides will give you a fabulous extra personal and first-hand insight to their culture. Suitability: This trip is suitable for anyone with a reasonable level of fitness. This trip is not too arduous, and so riders with less experience are more than welcome, although the fitter you are, the more you will enjoy it. An air-conditioned bus travels behind the group for support. On some occasions, when it is impossible for the bus to follow on the dirt tracks, we arrange for motorcycle back up with snacks and water. Biking Conditions: This trip is mainly on good-quality tarmac roads and some vehicle-width dirt roads. A support truck is always available to help when required, and participants can cycle as much or as little as they like and still enjoy the same views as the rest of the group. Upon arrival we meet at Northern Hotel, Ho Chi Minh City, aka Saigon. After bike fitting and trip briefing you are free to explore the city before returning for a welcome dinner at the renowned Temple Club Restaurant. Today we transfer a short distance out of bustling Saigon and start riding to the haunting Cu Chi Tunnels, which the North Vietnamese Army (NVA) used during the Indochina War as their stronghold and torture site of foreign POWs for decades. After witnessing the war's devastating consequences, we return to Saigon by bus just in time for a visit to the notorious Museum of War Crimes. Dinner is your choice. We rise very early this morning and transfer to the airport for a short flight to Dalat, once a favorite summer retreat among the French and Vietnamese royal families. Dubbed “Le Petit Paris”, the city is now a popular honeymoon destination for Vietnamese newlyweds. Upon arrival, we'll hop on our bikes, start off with a relatively easy ride around Dalat past Xuan Huong Lake, colorful flower plantations, the Old French Railway station and cycle out of town on picturesque and nearly traffic-free country lanes and back roads. After cycling in the shadow of Mount Langbian, we return to Dalat for dinner and you are free to take a walk to explore this lovely city. As we head towards Nha Trang, a famous seaside getaway, we’ll tackle some challenging hills before being rewarded by smooth descents with lush mountains as our backdrop. Our first break will be at the community house of highland hill tribe people, then we muscle up again to conquer Hon Giao pass (1,650 m) before a 30 km downhill to have lunch at the local restaurant by the river. In the afternoon it is back on the bikes for 28 km on a flat road. A short transfer takes us to the resort for a lively evening. For a rest day off the saddle we take a boat trip to stunning coral islands for swimming and snorkeling. On the way back we'll have a cultural stop at Pa Na Gar Cham towers. Built between the 7th and 12th centuries, four of the original eight towers are still actively used for worship by Cham, Chinese and Vietnamese Buddhists. Alternatively, those who would like to take it easy can lie down and soak up the sun by the beach. Following breakfast, we cycle out of Nha Trang and then take a short transfer to avoid busy Highway 1. Back on the bikes we cycle on to Dai Lanh Beach where we'll have a beach side lunch with time for a swim in the blue waters. To avoid another busy section of road a 20 minute transfer takes us to the start of our afternoon ride on a coastal road snaking along the base of Da Bia Mountain. There will be some gentle climbs before we drop to the flats and finish our day on quiet countryside lanes that are a mix of tarmac and dirt, passing soothing rice paddies and peaceful villages. After transferring out of town to avoid the main highway we start biking along a remote, but well-surfaced road running parallel with the railway. The terrain rolls gently with breathtaking views of the highland hills. As we cycle through tribal and Viet villages we'll also spot potbellied pigs and barefooted children trotting across the trail. We then return to the highway and transfer a short distance to Quinhon. Today we follow the coastal road to Tra O Lagoon, the largest wetland in Binh Dinh Province and also a principal food source for the locals. While rolling we also take in the sea breeze and spot tranquil fishing villages lined along the coastline. After lunch at a local restaurant, the ride continues to Highway 1, where we transfer to Quang Ngai for the night. In the morning we start cycling from the hotel to have the first stop at My Lai, the site of one of the deadliest massacres during the Indochina War. After a guided tour we continue cycling along the coast, passing many picturesque fishing villages with their colourful boats. We stop riding at lunch and transfer on to Hoi An so we can have the afternoon free to explore this historic town. A major trading port during the 17th and 18th centuries there are 844 structures of historical significance and many vibrant shopping streets, the city is a must for you to wander around and absorb the atmosphere. This morning we have a short transfer to avoid the highway and start riding to My Son, the ancient centre of the Cham Civilization dating back to the 4th century. We then cycle along scenic country back roads flanked by rice paddies, eucalyptus plantations and relaxing villages. Later the road stretches away from the coast, offering stunning views of the ocean as we head to My Son, once Champa’s most important city. After lunch we spend the afternoon visiting the site, and although many of the temples were destroyed from heavy bombing, enough have survived the war to impress most visitors. After the historical tour, we take the bus back to Hoi An. Dinner is your choice. This is probably the toughest ride of the tour, yet it is also one of the most rewarding. A short transfer out of Hoi An brings us to the start of our ride along the beach to Danang, known to some as China Beach, an R&R destination for American troops during the Vietnam War. It will be quickly time to change your gears and start the climb up Hai Van Pass, a steady and moderately challenging uphill with exhilarating views of the coast. From sea level we climb up to 480 m before flying down a long and smooth descent After lunch we venture away from the main highway and cruise on a coastal road for 44 km to Hue, the old capital of Vietnam during the Nguyen Dynasty. Today we explore by bicycle and boat the rich history left behind by the emperors of the Nguyen Dynasty. We start by cycling directly from our hotel along the An Cuu (Perfume) River and head up to the tombs of Khai Dinh, the 12th king of the Nguyen dynasty, which were built from 1920-1931. After our visit, we continue to bike on a quiet route to Vong Canh hill, which is just 43 m high, but is the best place to catch a panoramic view of the Perfume River. We finish the ride today at the seven-story Thien Mu Pagoda, the tallest religious building in Vietnam. Built in 1601, it has become the symbol of the city, and be sure to get a photo with the marble turtle! We then walk to the boat pier nearby the pagoda to take a cruise on the Perfume River back to Hue. After refreshing ourselves and packing up we have a dinner at a local restaurant before boarding an overnight train to Ninh Binh. We arrive in Ninh Binh around 10 am (arrival time may vary). Following a short transfer to the local restaurant for washing up, bike fitting (we have new fleet of bikes in the north) and an early lunch, we start cycling through spectacular karst mountains towering over a blanket of rice paddies to the ancient city of Hoa Lu, the capital of Vietnam in the 10th and 11th centuries. After touring the temples we continue to Cuc Phuong National Park, Vietnam's first and largest natural reserve to check into our accommodation at the park. We enjoy another ride to appreciate the park's beauty, visit the primate rescue centre and head east on serene back roads through a sea of pineapple plantations. Today while riding you’ll notice the differences between North and South Vietnam ranging from crops, villages, to clothing as we pass through countless lush greenery, lovely villages and friendly locals. Today's ride finishes just before we reach Highway 1 and our transfer to Hai Phong, one of Vietnam’s major ports. We transfer to the pier to catch a ferry to Fulong on Cat Ba Island. Located at the southern end of picturesque Halong Bay, the island is home to one of Vietnam’s most exquisite natural treasures, Cat Ba National Park. Once we get off the boat we cycle 26 km on the island’s only road before enjoying lunch in town. In the afternoon you are free to explore the surroundings before spending the night on this heavenly island. We have a short ride in the morning and head for a memorable cruise through majestic Halong Bay. With its towering limestone karts protruding from the emerald sea, Halong Bay is truly one of the most spectacular natural wonders in the world. Legend has it that it was formed by a great dragon that descended from the mountain into the sea. The boat trip is definitely rewarding after the long biking expedition. We then transfer to Hanoi and meet again in the evening for our farewell dinner at one of the many fine restaurants in the city. In the morning you are free to do last-minute shopping or take a short tour around the Vietnamese capital before catching your onward flight. If you would like to extend your stay in Hanoi, please contact us for best hotel deals and rates. You can also hire an electric bike (or an E-Bike) for the price listed in the tour pricing section. We have 2 sizes available: S = 155 cm - 170 cm and M = 171cm - 180 cm. The E-Bikes are GIANT brand with SHIMANO Alivio1,9 speed, disc brakes and adjustable suspension fork.